As a classic car reporter I rarely get the chance to wax lyrical about the joys of the motorcycle world. I have always had two wheeled transport in my garage and for me the scooters of the 50’s and 60’s just bring to mind a stylish and optimistic era. Yes, I realise that most people will have visions of Parker coats, multiple mirrors and mods on Brighton sea-front but my thoughts are more towards suited men wearing a tie and ladies in cool frocks cruising in the warmth of some Mediterranean town; all very art deco, like the advertising of the time it promoted this type of travel to iconic status. The machines are an original Lambretta Li150 Silver Special and a beautifully restored Vespa 150 Sportique. To those who are not lovers of two wheels they are very similar but to a scooter fan they are completely different. They do however have one major thing in common; they were both assembled in the UK. I must confess this was a new one on me, firstly I heard that Piaggio together with Douglas Motorcycles put together a deal to build Vespas in Bristol, then Lambretta owner Jeff Swann informed me that this machine was built in Croyden at the Trojan works along-side Heinkel bubble cars. Trojan had their fingers in a lot of pies, well a certain Peter Agg company owner did, a real character with drive and ambition was not afraid of the unusual. At the same time as the Heinkel and Lambretta he also took over Elva Racing building the Courier sports car and later the racing Mclaren-Elva. The future would see him go on to produce the Trojan Formula 1 car and lead the Suzuki Motorcycle GP Team along with a young Barry Sheene. Peter Agg unfortunately passed away March 2012 aged 82, I enjoyed (and recommend) researching his achievements of which the Lambretta was just a small part. 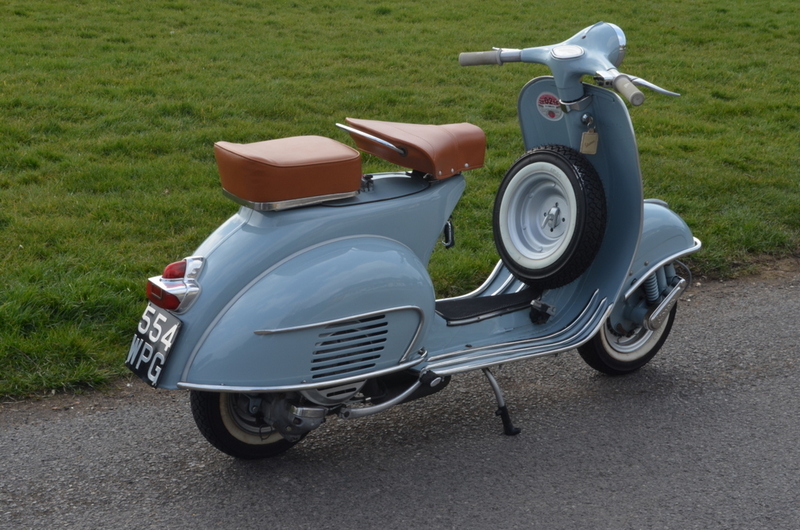 This Lambretta is a 1965 Li150 Silver Special (there was also a Gold Special) Pacemaker model (the name given by Lambretta Concessionaires Ltd). The Pacemaker name introduced a very British feel after ‘Gerry and the Pacemakers’ and the band were used extensively in advertising and promotions. 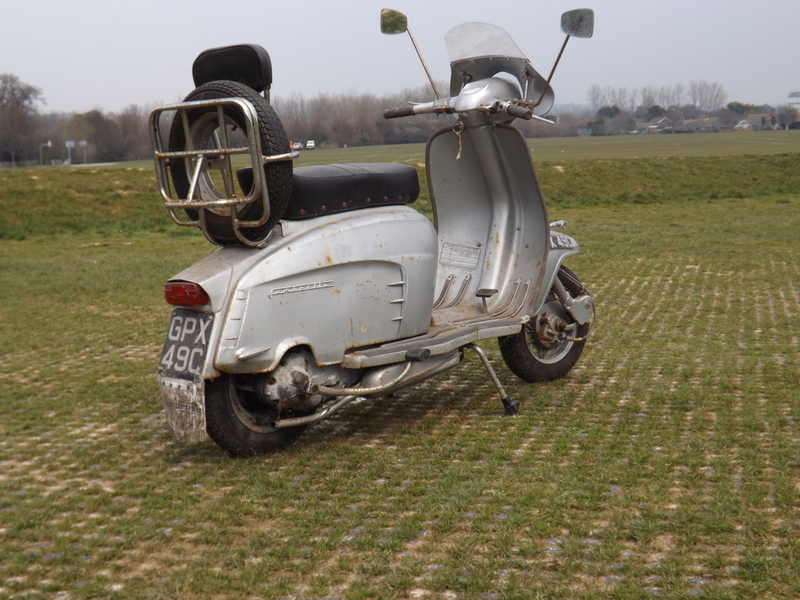 Owner Jeff is an interesting man (as scooter riders tend to be) who acquired the Lambretta in the late 80’s when he did a swop, the Li150 for his Rossini shotgun! 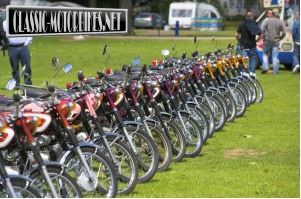 He operates Sussex Rider Training and to continue the theme he conducts the Quadrophenia Tour in and around Brighton. For the future the scooter will be restored to its former glory and once again flirt with the traffic and day trippers on the sea front. As large amounts of these two wheeled wonders were being built and sold worldwide Lambretta had competition in the marketplace from Piaggio and the Vespa. 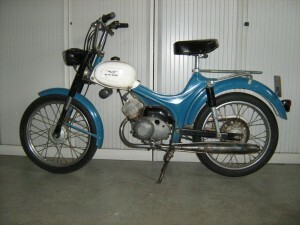 Managing Director of Douglas Motorcycles Claude McCormack admired the little Vespa scooter whilst on vacation in Italy; he contacted Piaggio and struck a deal to build the Italian machine under licence in England. It was the break Douglas needed as at the time they were virtually bankrupt and so production began in 1951. Ten years on and this Vespa 150 Sportique left Bristol and became its first owners pride and joy, by this time Westinghouse had taken control of Douglas. Research indicates a troubled relationship between the UK and Italian factories continued from 1951-1965, many disagreements over production numbers; or the lack of. Unlike its rival Piaggio were reluctant to have the latest models produced in the UK and so the Vespa was considered behind the Lambretta in development. Current owner of the Sportique Simon Day has been around scooters all his life, he was the owner of Scooterific from 1999-2003 that quickly became one of the best dealers in the UK and top regional dealer. His other working passion was the 2CV and whilst carrying out serious repairs to such a beast in 1994 the opportunity of acquiring a rather neglected Vespa arose. It had been standing idle for a long time and a full restoration took place on and off between 1996 and 2007. The 145cc engine was stripped and new main bearings and seals fitted. The bare metal rebuild involved all parts of the chassis and bodywork; repaired, restored and repainted in a lovely soft pale blue. A real attention to detail is evident; I really like the seating with the passenger side saddle version for the lady with the long dress. Simon gave up his business a few years ago and became an author writing about his time growing up around the motor trade, 2CVs and scooters in particular. I am currently reading his interesting and very witty book ‘A tale of two CVs’. For the future Simon is looking into a top end engine performance conversion and to just enjoy his lovely machine. My thanks go out to Jeff and Simon for their time and help in putting together this issue aritcle, I really enjoyed the ride.